"Before reading your book, I had found no resource that had it all, especially words for those who love and want to help someone we fear is a disordered eater. I have read your book cover to cover and plan to recommend it to everyone who asks me questions because you have done an incredible job at answering them all." "The first read-through confirmed some things I already knew about eating disorders and opened my eyes to a lot of misconceptions I had had. Most importantly it gave me hope. The second read-through spoke to me very personally about my own daughter and helped the entire family through the difficult recovery process that left us all reeling." 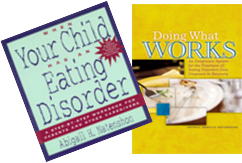 First of all, thank you for writing, When Your Child Has an Eating Disorder: A Step-by-Step Workbook for Parents and Other Caregivers! I am just finishing it and have found it to be the most useful written resource for me yet. I am the father of an eating disordered daughter. Your book has leapt out at me. You have captured so much of what we have experienced and considerably more. In our search for assistance over the past 5 years, we have found only one other professional who has been able to come close to providing the degree of eating disorder family insights that you have presented here. "I found that the book gave me confidence to use myself more effectively to help my daughter recover. The more I relaxed, and the more hopeful I became, the more she was able to accomplish." "I feel as though you have invited my husband and I to look beyond the symptoms of this disease to see what's at its core ... the suffering in our daughter's heart. Most important, you keep reminding us that this disease can be, and usually is, conquered." "I read it twice and loved it. Boy! You really take on the establishment!" "Only a mother could have written this book." "It is nice to read a book that is positive and gives us hope that it is possible to get past this horrible horrible sickness." "Dr. C. suggested your book to us as a resource, in understanding Shannon's disease and the issues she faces every day. I have read many books on this subject; however, the information you provided has been invaluable and was the most useful. It makes sense out of this chaos. Especially after treatment, when the really hard work begins, it offers guidelines for the parents and friends of the anorexic child. "Even now, six months after her treatment, copies of my favorite chapters are here on my desk at work, to read at those times when I need motivation and guidance. The disease is overwhelming to those who love the anorexic child but I have found that I don't feel so alone in this struggle having the wonderful resources that are in your guidebook. Thank you for all you do for those who suffer through this disease and for providing unending courage and hope that the future will be better." 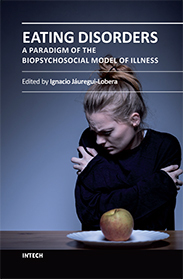 "This is an intelligent, informative and probing work that should be every parent's companion through the assessment of their child and their family, and through treatment and recovery of an eating disorder." "Natenshon's voice is a soothing one of gentle authority that helps parents grow and nurture their children as they learn to face the pain of life again." "Your book is important to me not only because it tells parents what to do, but because it offers advice to individual therapists who are at a loss about what to do to treat the family." "I appreciate so much the non-blaming stance taken towards parents. It is so fundamental to support the families and parents! I appreciate your book as an important and useful resource for parents and a fundamental addition to the literature. Thank you for such a terrific contribution." "One woman in my therapy/support group came to meetings clutching your book to her breast. She claimed it was her lifeline and that it was the only thing that gave her hope when she was feeling frightened and lost." "I have used your book as the main parent education tool in my practice at the duPont Hospital for Children, and the feedback was always positive I also use your book extensively in my teaching at the University of Delaware." —Feedback from a health professional and educator. "Abigail has a wholesomeness and gentle, intuitive expertise that renders her the perfect voice ... Abigail is amazing. And I'm so grateful to you for introducing us to her in this way." "For the past year, I have used your book exercises as self-awareness and self-assessment tools in the therapy groups I run. They have been invaluable to my clients as well as to me. Thank you." "We have very limited resources in our area. Your book has become a lifeline for us." The Center for Counseling & Health Resources, Inc.
—Edye Berkun Kamensky, Ed.A., M.A.